This skillful artist is distinguished by his energetic stage shows. From the Kennedy Center to concerts with some of Native America's most dynamic artists, such as Pura Fe and Dylan Jenet Collins, Ed Koban, has a truly classic career! 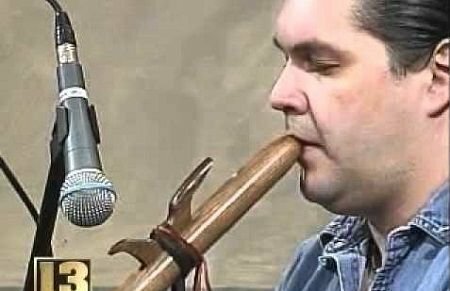 Ed Koban is a guitarist and Native American Flutist, from Niagara Falls, NY. He has performed with several respected artists including, Grammy Winners Joanne Shenandoah, and Janice Marie, Rock and Roll Hall of Fame Inductee: Nokie Edwards, as well as, Pura Fe, Gabriel Ayala, Tonemah, Star Nayea, Cody Blackbird, Leanne Shenandoah, Jan Michael Looking Wolf, Dylan Jenet Collins, and others. He has opened for groups like Foghat, Three Dog Night and Rusted Root, and has performed with artists at venues like the Kennedy Center and the 2002 Winter Olympics. Click HERE to learn more about Ed Koban.